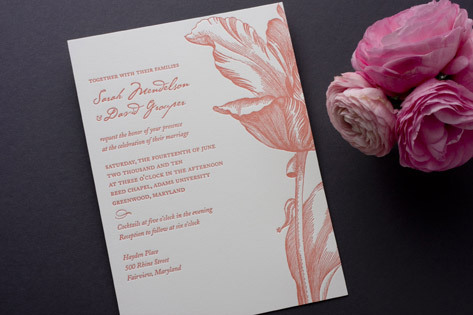 An intricately illustrated, eye-catching tulip illustration brings an elegant botanical tone to this upscale letterpress wedding invitation, which would be the perfect choice for a spring or summer celebration. Butterfly accents enhance the natural theme and add understated whimsy to the suite. Available in salmon (shown), lavender, and grass.